Mention the words “gated community in Marbella” and a number of things come to mind. Probably things like safety, security, exclusivity, celebrities, expensive homes, and more. There are a lot of benefits to living in a gated community lifestyle in Marbella but choosing to live in a gated community is a personal preference. Why should you choose a gated community among all other types of living options? Exclusivity and privacy are the primary reasons for people opting to stay in gated communities. Everyone who wishes to enter this exclusive zone must key in a security code. It means that no stray individual can willingly enter the community. Another important factor is security. When it comes to you enjoying a higher quality of life. One point to keep in mind is that there are different types of gated communities. Some communities feature 24-hour staffed gatehouses and others simply use automated gates with a security code, CCTV from various security points and also dog patrol, security guards take trained guard dogs with them on their patrols. You feel secure when you live in a gated community. Safety measures are present to ensure that you remain immune from the problems behind those walls. The well-known Don Gonzalo building in Marbella is considered one of the most exclusive complexes in the city with its majestic marble facades. It is a luxury residential complex located in a unique enclave between Marbella Centre and Golden Mile. The gated community has concierge day and night and a sophisticated 24-hour security system. It consists of 106 apartments, each endowed with individualized alarm, in the second line of beach where we can enjoy impressive gardens and fountains with night illumination. In Nevado Realty we have a wide selection of properties in this emblematic building. Like this stunning penthouse for sale with panoramic views and private pool. This apartment has 3 bedrooms and 3 bathrooms, two of them ensuite. The exterior area of the attic consists of 3 totally different areas: a beautiful gazebo with table for 6 people and 2 chill-out areas, one facing south, with open and panoramic views of the Mediterranean Coast, Gibraltar and Africa and the other facing north with mountain views and in the central part, higher than the rest, there is the beautiful swimming pool with a Balinese bed and a hammock area for sunbathing. Gran Marbella is one of the best and more exclusive buildings in Marbella city centre with direct access to the Promenade and the beach. This luxury complex is fully gated with 24 hours security and concierge service. You will enjoy 4 swimming pools and lush well maintained communal gardens. There is a solarium on the roof terrace with sun beds and automatic showers offering stunning views to the Mediterranean Coast. 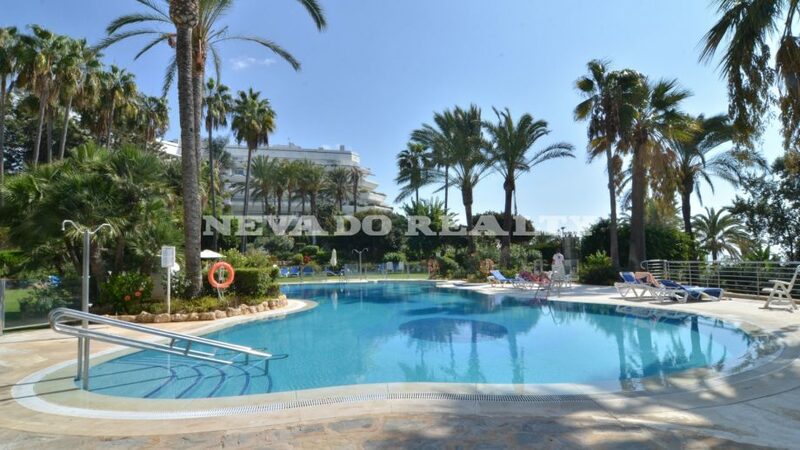 Have a look this frontline beach ground floor apartment for sale with sea views in this complex. The apartment This ground floor apartment has 3 beds and 2 baths, living/dining room with open plan kitchen aside given access from here to the private covered terrace with views to one of the communal pools and the sea. An apartment ideal for families. Do you know who develops the first gated community in Marbella? His name is John Green, a British developer who came to Marbella in 1970. Recently he has been awarded for masterminding one of the first gated communities in Marbella. In the early 1980’s, he developed the well-known El Ancon project of 12 villas on the Marbella beach, east of the Oasis Club, followed by the El Ancon Sierra project whose first phase was finished in 1983 when the clubhouse was inaugurated by Princess Michael of Kent. El Ancon Sierra was one of the earliest gated communities in Marbella, with full services unheard of at the time, including central gas, 24-hour security, an administration office with a secretary to look after owners’ needs, a heated pool, a clubhouse with a restaurant, and many other features. Well, there you have it. Security is pretty tight in Marbella’s gated communities. If you’re looking for a safe and quality home in Marbella, feel free to contact us and have a look our selection of properties in gated communities.